How much does it cost to travel Cambodia? In this guide, we’ll help you understand the cost of traveling Cambodia, share Cambodia accommodation prices for various budgets, give you our best tips for finding cheap hostels and hotels in Cambodia, and help you choose the most appropriate budget for your travel style. Use the links below to jump to that section. Note: This Thailand Travel Costs Guide includes affiliate links. That means Go Backpacking may earn a commission if you click through to purchase or price something out. It doesn't cost you anything extra, and helps support this site. Cambodia is a thrilling SE Asia destination, and though most travelers are attracted by the stunning temple complex of Angkor Wat, the Kingdom has so much more to offer. The costs of travel in Cambodia are toward the lower end of the budget spectrum, however, be careful as some may try to get more money from you by charging US Dollars for small things like food. Example: a coconut might cost 2,000 KHR ($0.50), but a vendor might just say $1 to a foreigner. Cambodia uses the Riel (KHR) currency, though US Dollars are almost the preferred monetary currency throughout the country. It's wise to carry a supply of USD when visiting Cambodia. Most accommodation options in Cambodia deal only in dollars. Siem Reap, the entrance town of the famous temples of Angkor Wat, as well as Phnom Penh are loaded with all sorts of accommodation options. As with much of SE Asia, it's usually easier to find a friend and lodge in a double room than find a dorm room. The best way to find cheap deals on hostels and hotels in Cambodia is to use Hotels Combined to compare prices with Hostelworld. Hotels Combined compares Booking.com, Agoda, Hotels.com, Priceline, and many others in its price comparisons. Most of the popular search engines (Booking.com, Agoda, Hostelworld, etc) have many different accommodation types in Cambodia. However, we’d recommend you start your search with Hotels Combined. Hotels Combined is a meta-aggregator. It compares the deals offered on other popular booking sites to find the best price. It doesn't include Hostelworld, so you’ll need to compare that site on your own. Below is an example comparison we did for Hostel Salakamreuk in Siem Reap. The first picture is the search results on we found on Hotels Combined — $2.00US per night for a dorm in a 10 bunk dorm. The second search shows the search results on HostelWorld — $5.00US per night for a dorm ($4US for a female only dorm). The amounts don’t seem like much, but the initial Hostelworld price is 60% more expensive. This image shows the same search on Hostelworld, 60% more expensive than the deal found on Hotels Combined. Because some of the aggregators add on “fees and taxes” which takes the price back up to $3.32, that’s still 30% cheaper than the HostelWorld deal. We get into the specific prices below in our Sample Cambodia Accommodation Budget, but we've tried to give a decent idea about the actual savings you can expect by using this resource. We think that’s worth a bit of effort! Try it out yourself here! Hostel Salakamreuk for those who want a bit more space in a quieter spot, $3US a night for a dorm, or Boutique Dormitory Kochi-ke is a bit closer to the center and its nightlife also for $3US per night for a dorm. If you can stretch it, and want to party, grab a bed at Funky Flashpacker for $5.00US. Highly rated Onederz Siem Reap has bunks in dorms for $8.50 a night. It’s right in the center and has a pool, bar and restaurant on site. One Stop Hostel is another really well liked spot for $6.50 for a dorm and it’s super close to all the nightlife. For a quiet spot to relax after a long day, double rooms at Golden Takeo Guesthouse are $20 a night, with breakfast included. If you prefer to be in the action, Siem Reap Pub Hostel has great looking private rooms with private bathrooms for $14.30 a night. Swimming pool and restaurant on site. In the old center and cheap, rooms for $5.00 a night at Chhaya Hotel. You could also try Shang Hai Guest House, it’s a further walk from the river and the center, but quiet and friendly, $5.00 a night for a double room. A double room with private bathroom at Royal Hotel Battambang can be had for $14.00 a night. It’s nicely located close to both the river and the historical center, and a has a rooftop restaurant. The Asia Hotel gets some great reviews, is close to Boeung Chhouk Market, slightly away from the historical center but tuk tuks are cheap and always plentiful, or hire a bike from the front desk. Cheaper rooms are fan only, a bit extra for a/c. A well located, and well liked place like 19 Happy House Backpacker has bunks for as little as $3.00 per night. Cheap beds and good vibes can also be found at Velkommen Backpackers (now rebranded as Riverside Backpackers) for $3.00 a night. Lovely Jubbly Villa is well located close to many tourist attractions, has a swimming pool, bar and restaurant onsite, and many different room options. Great looking comfortable bunks in dorms can be had for $6.00 a night. A private double room with shared bathroom is a super modern place like Sla Boutique Hostel go for $21.00 a night. Alternatively, the popular Alibi House has large double rooms with private bathrooms for $23.00 a night and has a very nice garden and terrace area. Backpacker Heaven Hostel has a swimming pool, bar and restaurant, and overall good vibes, bunks can be had for $4.00 a night. The Big Easy is another popular and lively spot where bunks in dorms are about $5.00 a night. Onederz Sihanoukville is highly rated for its cleanliness, location and its value. It has a swimming pool and shared kitchen, dorms for $9.00 a night. Or if you want to be a bit more remote, head just out of town and get a bungalow at Mama Clare’s for $10.00 a night. Quiet beachside bungalows at Hi5 Bungalows are $20 a night and is close to beach bars, restaurants and entertainment. If a beach resort feel is what you’re after, check out the 3-star Sok Sabay Resort with beautiful air-conditioned bungalows for $25 a night. Back in Phnom Penh for a night before you fly out, obviously you can stay where you stayed before, a cheap bunk somewhere in town and take a taxi, or check out KOL House for a double room for $15.00 and a quick jaunt to the airport in the morning. Or try TOP Hostel for $20 a night. S-Susheel Mart Guesthouse is the best rated guesthouse we could find close to the airport in a decent price range. Free airport shuttle, breakfast included and the owner really takes good care of the guests. Not much around the airport but if you have time, they can arrange transport into the city, $21.00 a night. Spend a comfortable night near the airport at the 3 star 9 Dragon Hotel & Restaurant. It has a pool, fitness room, restaurant on site, small breakfast is included, and there is a market quite close to get a little something else. Double rooms go for about $38.00 a night. “On the cheap” (bunks as cheap as possible) $50.00 – $58.00US. 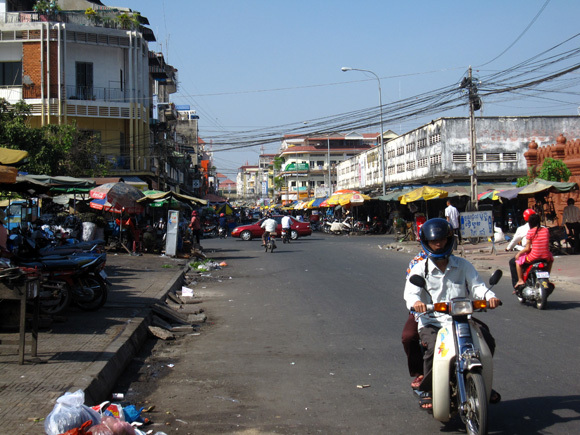 Motorcycle taxis: Throughout the cities of Cambodia, random men with motorcycles will pull up and offer a ride on their personal motorcycle for a fee. This method of transportation relies squarely on your judgment as to whether the price is worth it or not. I'd say somewhere around $1 for a 5 – 10 km ride, and less for a tiny 1 km ride. Motorcycle tuk tuks: Carts pulled by motorcycles are the most common form of taxi around towns, rates shouldn't be much more than a dollar for a short ride. Buses: Bus from Siem Reap to Phnom Penh: 6 – 7 hour journey on the local bus can cost $5 – 6, on the more tourist oriented bus the journey can run around $10. 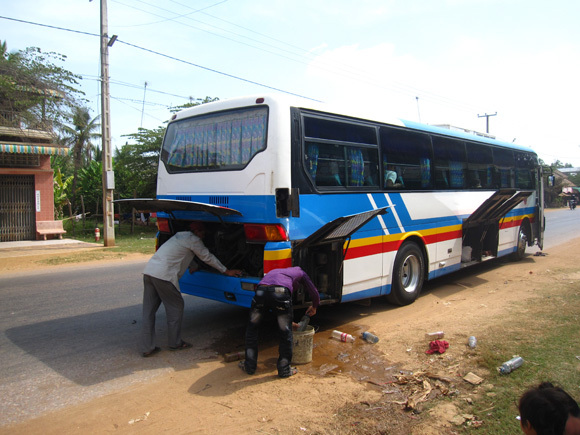 The bus from Phnom Penh to Sihanoukville (5 hours) is $5. Cambodia has a few discount airlines that can get you from place to place quickly and comfortably. We recommend using Skyscanner to compare the best deals, here is an example of domestic flights in Cambodia. Download the Skyscanner app to check out all the great deals on airfare for Cambodia and beyond, iOS click here, or Android click here. Around the major tourist attractions (namely Angkor Wat) prices for everything are inflated. Food can still be found quite cheap if you look to where the locals eat. If you like to dine at restaurants with nice seating environments, designed for foreigners, the prices of food can be relatively expensive. Street food is not as sanitary as in Thailand, but I ate it every meal and never had a problem. 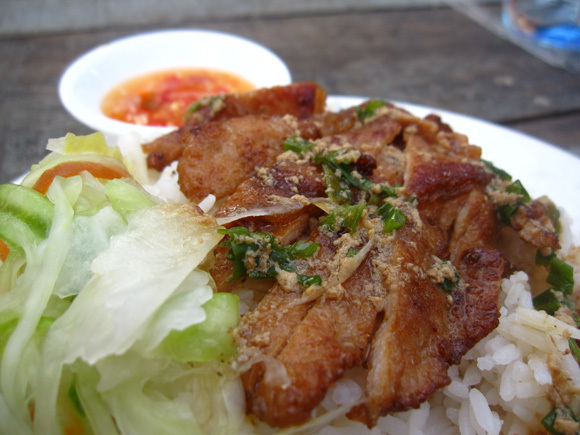 Cambodian food is a delicious combination reminiscent of a Thai and Vietnamese fusion, along with a few fantastic noodle dishes. For nicer sit down restaurants it's common to eat meals for anywhere from 10,000 to 20,000 KHR ($2.50 – $5). Most of the drinking and partying is done at small guest house bars and hang outs around the area. There are plenty of clubs and nightlife options within Phnom Penh if you are up for it. Big bottle of Angkor beer: 5,000 KHR ($1.25), while some places will just charge $1 for a beer or drink. While Cambodia is famous for a few attractions, the most interesting sites can be seen just walking around, visiting with Cambodians and sampling the local cuisine. 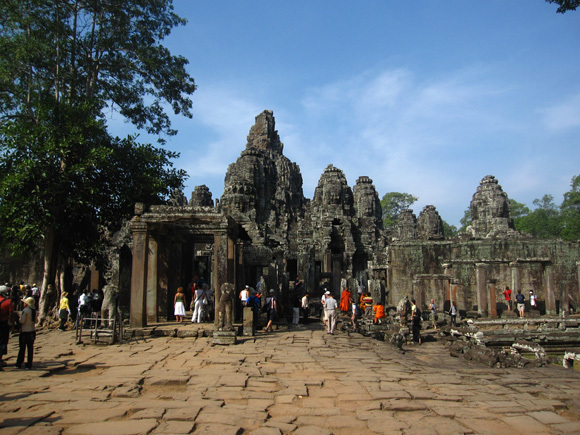 The low cost of food and accommodation in Cambodia makes it a great budget travel destination. With the exception of Angkor Wat, I was able to get away with spending around $10 – $12 per day on average. If you do plenty of activities and quite a bit of drinking, you might budget anywhere from $15 – $30 per day.